Before the Jets fell, ugly, to the Dolphins and to 2-10, every offensive starter received an individual pregame introduction. 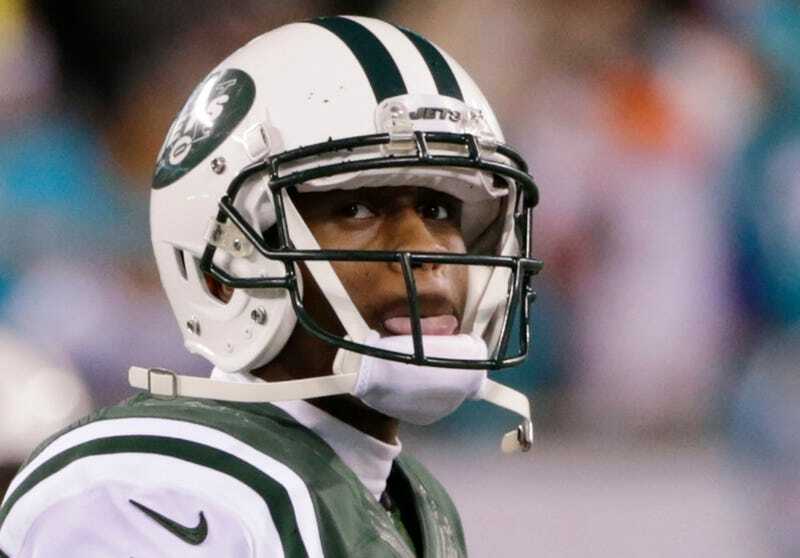 Every starter save Geno Smith, who entered, quietly, with the rest of the team. "It had zero to do with us not having faith in our quarterback," Ryan said. "It had everything to do with us trying to win the game." Again: it is hard to read that quote as anything other than an indictment of the team's confidence in Geno Smith. This is a five-week audition for Smith, five weeks to show the front office something to convince them they don't need to start over and draft or sign a QB. (Who's he trying to convince? Good question. Ryan and GM John Idzik won't be around to be a part of that decision.) So what did the Jets do, already well out of playoff contention and at this point only concerned with saving face? They took the ball out of Smith's hands. The imbalance was stunning. The Jets had 131 rushing yards in the first quarter—an NFL record this season—and 210 by the half. Twenty-nine of New York's first 35 plays, and 41 of its first 49, were designed rushes. Smith finished the game just 7-of-13 for 49 yards (including two sacks). "If we throw six and we're rushing for 210 yards [at the half]," Ryan said, "we'll sign up for that every week, even if we have Joe Namath at quarterback." Pro Football Talk's Michael David Smith has some more fun(?) facts from the night, on how rarely desperate a team has to be to resort to play-calling like this. "This is the most fun I've had all year," said Chris Johnson, who had his first 100-yard game as a Jet. And it was fun, while it was working. Despite the wet weather and sloppy field and the fact that everyone knew the Jets, with their 32nd-ranked passing offense and second-ranked rushing offense, were going to pound the ball all night, the Dolphins couldn't stop it early on, and headed to the locker room trailing. And then the Dolphins made adjustments, and the Jets didn't—or couldn't, or wouldn't. With an overwhelming ground advantage like the Jets had, the only thing that usually stops a defense from selling out to bottle the run is the promise, or even just the threat of taking to the air. Any other team besides New York would have mixed in just enough play-action looks to keep linebackers honest and safeties from pinching up. The Jets didn't bother—Smith attempted just eight passes before the game's final two minutes. So the Dolphins simply stacked the box. "We told [coaches] what we felt most comfortable with stopping the run," said Miami safety Louis Delmas of the player-initiated halftime adjustments, which mostly consisted of putting an eighth player in the box. The Jets kept running into it, gaining just 67 yards on the ground in the second half. Miami crawled back and took the lead with 1:57 remaining, so the Jets finally had to throw the ball—and now, the Dolphins' D knew it was coming. On that final drive, Smith was 3-for-5. Facing a prevent defense, his first four attempts were all short passes. The fifth was deeper, and over the middle, and was picked off to seal the loss. "I feel sick," Rex Ryan said. "We can't buy a win." As close as the Jets were last night, you'd think a team that desperate for even a small chance at a victory would be willing to throw up a Hail Mary for it. Or even just a regular old pass.